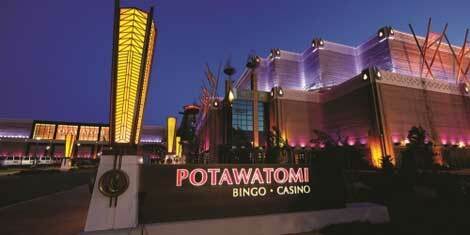 Potawatomi Hotel & Casino originally opened as Potawatomi Bingo on March 7, 1991. It was a 45,800-square foot bingo hall with 2,500 seats. A gaming compact was signed with the state in 1992 that allowed the tribe to add slot machines. In the following years the casino expanded in size and offerings. A $240 million expansion project was completed in June 2008 that tripled the casino's size, added new restaurants and also a 1,700-space parking garage. The name is officially changed to Potawatomi Hotel & Casino on July 1, 2014. That was followed in August by the opening of the hotel. 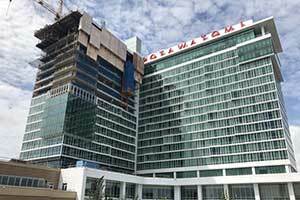 In 2017 the Potawatomi announced plans for a second hotel tower to open in July 2019. Booth and table seating on the 1st level. Traditional theater seating above. New 19-story hotel tower with 98 guest rooms opening date July 2019. On Thursday the new hotel tower at the Potawatomi Hotel & Casino lifted the highest beam into place. The new hotel project will be 19 stories and will be connected to the first tower. When completed the new tower will offer 119 guest rooms. The new tower is expected to be opened next year. The project was developed to meet the needs for more suites. The original tower was built in 2014 and offers 381 guest rooms. It is the same size as the new tower. However, the new tower will consist of 119 suites. This will bring the total amount of rooms at the hotel casino to 500. $80 million is the cost of the new hotel tower project. Residents of the city will make up 20 percent of the work being done. Minority owned companies will make up 20 percent of the subcontractor work. When the project is completed, 50 new employment positions will be created. In addition to the new hotel tower, there will also be a new event venue. The new room will be able to provide hosting space for conventions, large weddings, and banquets. There will also be space for back of house operations. The space will connect the casino to the tower. The new four-story addition will be 70,000 square feet. The Potawatomi Hotel & Casino, owned and operated by the Forest County Potawatomi Community. In 1991 the gaming venue first opened as a bingo hall. After several years of renovations and expansions, the casino now operates 2,500 slot machines, close to 100 game tables, a bingo hall with 1,300 seats, a 500 seat theater, and 7 restaurants.